Owing to the presence of experienced and skilful team members, we have been able to manufacture and export a high quality range of Cold Protection Glove. One can avail these gloves in various fabrics including leather, yarn, wool and others as per their requirements and choices. These are specially designed and developed using upgraded sewing machines to assure perfect stitching and durability. 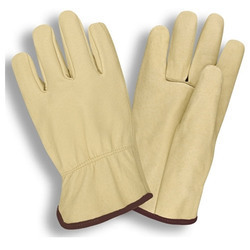 We are one of the leading manufacturer & exporter of Beige Grain Glove (Cold Protection). These are fabricated using high quality fabrics and yarns sourced from reliable vendors of the industry. Our Glove is extensively demanded for perfect fitting, easy grip and long service life. With the availability in various standard sizes and specifications, our Gloves are acclaimed for durability and easy maintenance. Moreover, these provide high warmth and comfort to wearer. We are engaged in manufacturing and exporting a wide gamut of Natural Grain Glove. It is designed with fabric at the backside and has the rubberized cuff. It is appreciated by our clients for easy grip, durability, and it also provides maximum comfort to the user. To meet the precise demands of clients, we manufacture and export a wide range of Beige Grain Glove. Designed as per international industrial standards, this glove ensure better grip and durability. This glove is specially designed keeping in mind the desired specifications of clients and to offer utmost comfort to them. 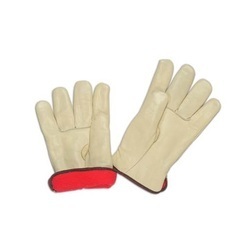 We offer gloves in various standard sizes and colors as per the demands of clients.